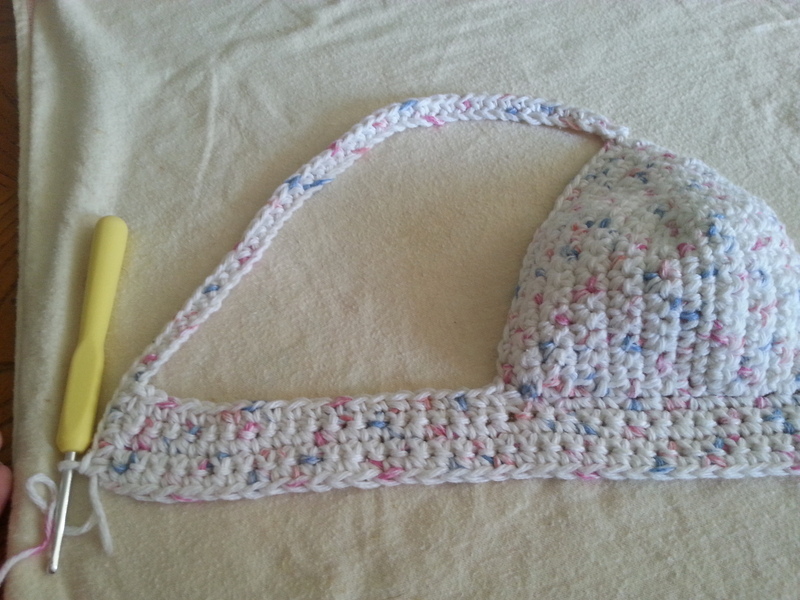 I have been trying to come up with different ways to create straps for a crochet bikini. I accidentally came up with this beautiful criss-cross back design when I made my straps a little longer than intended. I love the lace-up look of this design and it is very supportive & comfortable. 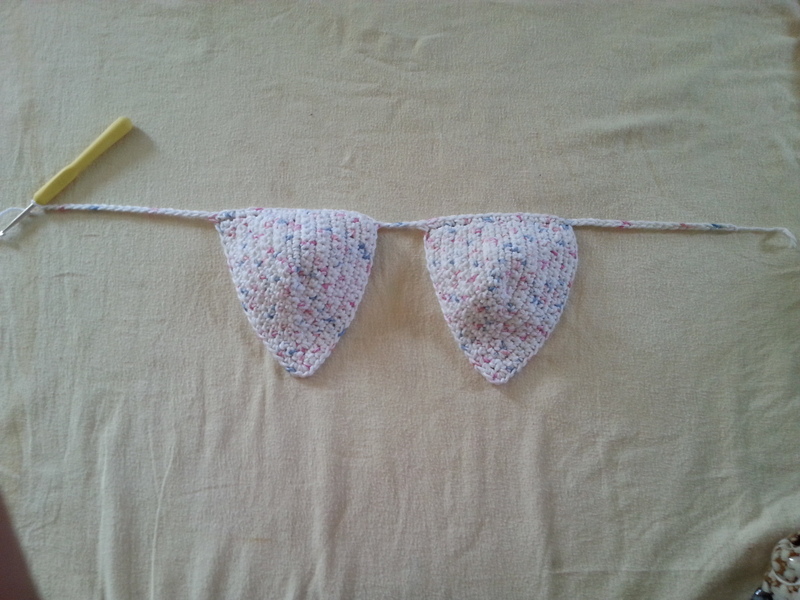 The straps are adjustable which is very important because crochet tends to stretch out especially cotton yarn. You will need 2 cups for this pattern. This pattern can be created using either of the style cups shown below. The classic triangle cup & the brassiere style cup. Click on the picture for links to the pattern. 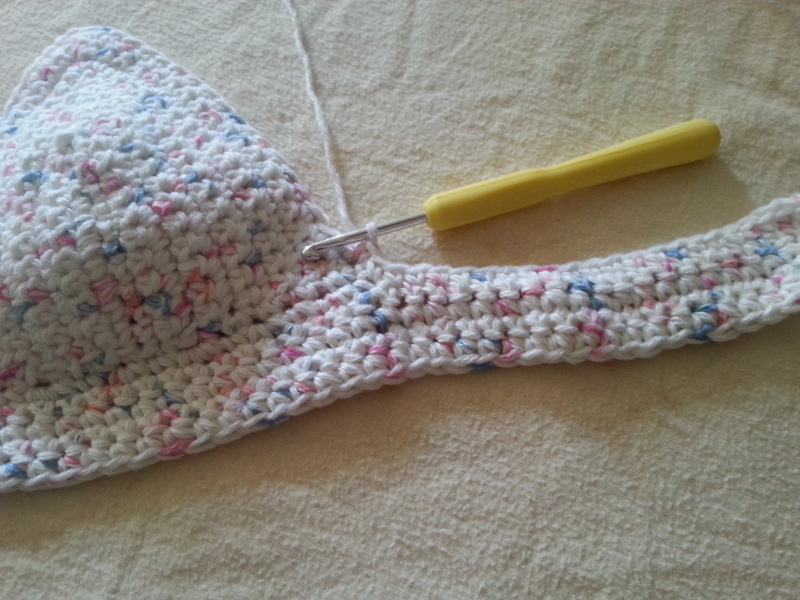 After you have crocheted both of your cups to your size & preference it is time to crochet the top. Begin w/ slip knot & ch the amount you need to reach from the edge of your cup to your mid back. This foundation chain will be one of your straps. [I chained 22 for my straps]. Once the chain is the correct length, sl st to the edge of your bikini cup. sc all the way across the bottom of your cup, placing 1 sc in ea st.
Connect your cups – depending on your measurements and preference you will either sl st the two cups together or if you need space between the cups ch the necessary amount. [I chained 1 between my two cups]. Sl st to the 2nd cup and sc all the way across this cup, placing 1 sc in ea st.
Row 2- Ch 1 & turn. sc all the way across the chain, both of your cups and along the other chain. Once you have the length desired for the straps and the under bust of this top it is time to create the straps that go over your shoulders. sc up the edge of your strap, placing 1 sc in each row, and sc along the top of your strap, placing a sc in each ch space (you should be crocheting down the opposite side of your original foundation chain). Once you reach the first cup, sc in ea st until you reach the top of the cup. Ch the amount needed for your shoulder straps and sl st to the end of the strap you previously created & you just crocheted across). After you connected the strap, sc back down the chain towards your cup. sc along the opposite edge of this cup, across your second cup until you reach your second strap. sc in ea ch space (you should be crocheting down the opposite side of your original foundation chain) until you reach the end of your strap. Ch the same amount as you did for your first shoulder strap and sl st to your second cup. Once your strap is attached sc back down the chain until you reach your strap and sc along the edge, placing 1 sc in each row. sl st to join. Using your yarn, make a chain that is long enough to thread through your top & tie. Align your stitches on both straps to make sure that they are lining up evenly. Decide how far up you want the criss-cross to begin and thread your chain through these loops. Then cross each end over one another and continue pulling them through adjacent stitches. You can skip every other stitch or as many as you want depending on the look you want & the materials you are using. Pattern Notes: Be sure to adjust the number of chains for your body measurements & to the materials that you are using. 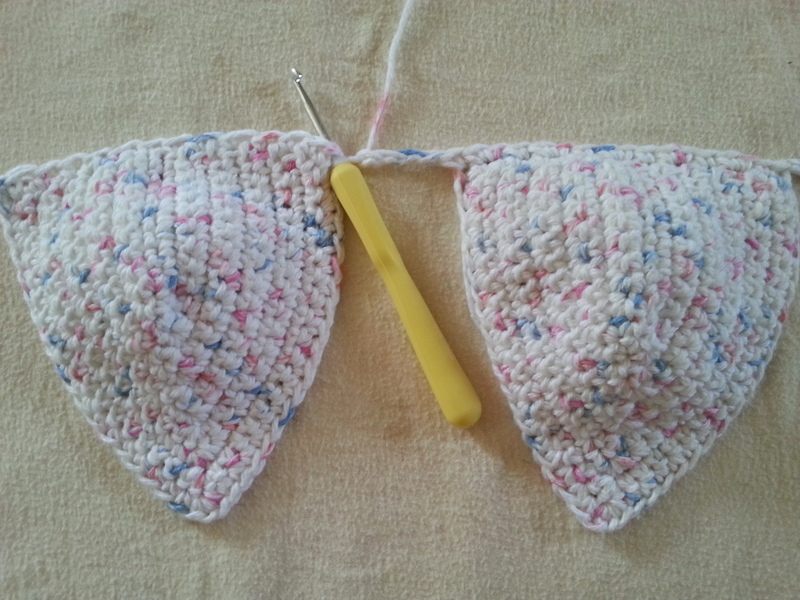 Crochet a single crochet gauge swatch to determine the amount you need to chain for the straps of this garment. This pattern is very simple if you get the strap measurements just right. Don’t be afraid to make adjustments to this pattern & leave me any questions down below. Tag me on Instagram @therainbowwarrior if you make this top! Posted in Crochet Patterns, Video TutorialsTagged crochet, crochet bikini, crochet bikini pattern, crochet bra, crochet pattern, crochet top, crochet tutorial, free crochet patternBookmark the permalink. I love this idea, but does this bra need 14 oz of yarn, it seem like a lot for a small item & is it 4 ply? Thank you so much for your great ideas. This is adorable… Can you do bottoms? !